Enter CRG Benefit Raffle for Chance to Win Great Prizes! 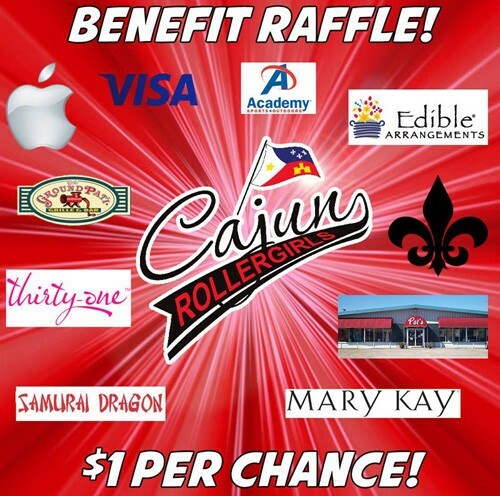 Just a reminder that your Cajun Rollergirls are currently holding a benefit raffle through this summer, and YOU could win some great prizes for a little as $1. How awesome is that?! GRAND PRIZE – an Apple iPad Mini! – A $25 Mary Kay gift card! As we said, tickets are only $1 each, and you can buy as many as you want! Also, as an extra added bit of lagniappe, if you buy a book of 20 raffle tickets, you also get a complimentary ticket to our Aug. 23 home season finale in Thibodaux vs. Acadiana Roller Girls! Score! Winners will be selected during halftime of our Aug. 23 game. You don’t have to be present to win (although it would be awesome if you were), and most raffle items can be shipped. So, if you live outside of the area, you can still take part! Proceeds from the raffle go to help your local flat-track roller derby league, the Cajun Rollergirls! Find your nearest CRG league member TODAY and get your raffle tickets!